BREAKING: Jega has announced a break in the announcement of the results, saying some results have yet to be collated. The funeral for a woman (pictured left) in Mexico took a strange but incredible turn when stray dogs unexpectedly showed up to pay their respects. 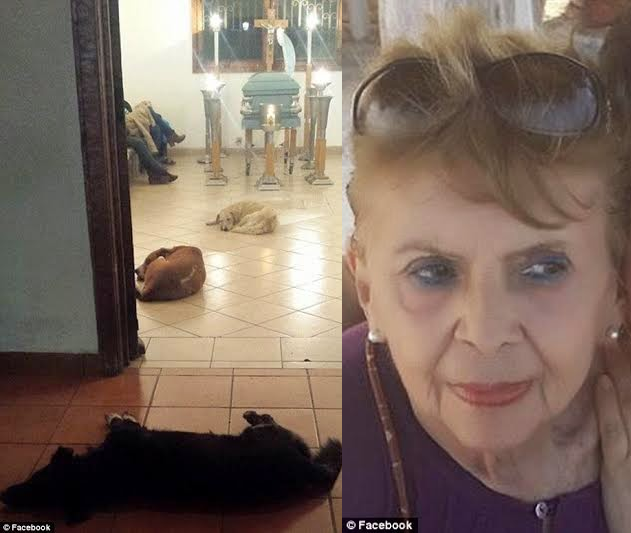 The woman, named Margarita Suarez was known for her kindness to all kinds of animals and used to feed stray dogs and cats that would show up at her home every day. Her family members said they were stunned when the dogs arrived at the funeral parlor where Margarita's body was lying in state. Governor Godswill Akpabio of Akwa-Ibom state and his Abia state counterpart, Theodore Orji won their senatorial contests in Saturday's election. Gov Akpabio polled a total of 422,009 to defeat APC's Inibehe Okorie who had 15, 152 votes. Gov Orji pulled a total of 46,070 votes to win Ahamdi Nweke of APGA who pulled 10,204 votes. While Governor Akpabio would represent Akwa Ibom north east senatorial district in the next Senate Assembly, Governor Orji would be representing Abia central Senatorial zone. Some voters in Benue state who were unhappy with the election results in the state set ablaze the independent National Electoral Commission, INEC, office in Logo Local Government Area on Sunday night. As Nigerians eagerly await the results of the elections which held on Saturday and Sunday in Nigeria, the All Progressives Council (APC presidential candidate, Gen. Muhammadu Buhari who is currently in his home in Daura, Katsina decided to spend his time waiting for the results by going through his campaign photo album and online comments with his political aides. According Daily post, The All Progressives Congress, APC, on Sunday called on the Independent National Electoral Commission, (INEC) to cancel the entire result of the 2015 Presidential and National Assembly Elections held in the State on Saturday. Although the details of the result was still being awaited, DAILY POST gathered that the PDP swept the House of Reps, Senatorial and Presidential elections. The presidential candidate of the All Progressives Congress, Maj. Gen. Muhammadu Buhari (retd. ), defeated the candidate of the Peoples Democratic Party, President Goodluck Jonathan, who is seeking re-election, in Ogun State. The Rivers State Governor, Rotimi Amaechi, is calling on INEC to conduct the elections in Rivers State, saying that after all that he witnessed on Saturday, there was no election at all in the state. Speaking to Channels Television’s election coverage programme, Nigeria 2015, in the early hours of Sunday, Amaechi alleged that there was a deliberate plan to truncate the process in the state. “I realised that in all polling units in my ward, all the result sheets had been hijacked and I sought to know why (and) the presiding officers reported that the EOs, that is the Electoral Officers had taken all the result she. Nigerian Prophet T.B. Joshua has warned of the death of a prominent politician due to ‘heated up’ politics in the wake of the closely fought Nigerian elections. “I am seeing Nigerians heating up politics,” the cleric told his congregation at The Synagogue, Church Of All Nations (SCOAN) on Sunday 29th March 2015. “Wednesday and Thursday of this coming week and next week, make sure you fast and pray,” Joshua stated just before the close of his church service at 7pm in a message broadcast live via Christian television station Emmanuel TV. Two INEC officials were killed by unknown gunmen at Nafada/Dukku federal constituency in Gombe state today. Continue to see photos from the scene but they are graphic *viewer discretion advised*. According to reports by Punch and Vanguard, President Jonathan lost to Buhari in the election conducted inside Aso Rock. At polling unit 22, PDP had 302 votes while APC had 348 votes, while at polling unit 21 - PDP had 293 votes while APC had 265 votes. Collation of results from both polling units gave the PDP a total vote of 595 while the APC had a total of 613‎ votes. The president won the election at the two polling units in 2011. Seven ladies who went for night vigil for deliverance in a new generation church, located at 2nd Cemetery Road, Benin-City, were allegedly raped by armed bandits who stormed the church at about 4am on Thursday. The robbers were said to have earlier raided a building near Ewuotubu community where they robbed some tenants living in four different flats in the compound. It was learnt that two persons, including a police officer, were shot dead while others sustained various degrees of injuries in the process. The Peoples Democratic Party (PDP) has charged Nigerians to totally disregard misleading figures being circulated by the APC in the social media as results of the Presidential and National Assembly elections in some polling booths. PDP National Publicity Secretary, Olisa Metuh in a statement on Sunday said the figures were “fake and do not represented the true results which are currently being collated by INEC, the only body authorized to release and announce results”. Today’s presidential and National Assembly elections have turned out to be a big nightmare for the All Progressives Congress (APC) in Rivers State, with the members being killed, attacked and disenfranchised in various parts of the State. The Nigeria Police has announced the death of Alhaji Muhammad Hurdi (pictured middle above), the Katsina State commissioner of police. The Police Public Relations Officer (PPRO), DSP Aminu Sadiq announced the demise of Hurdi in a statement issued to newsmen on Sunday in Katsina. Sadiq said that Hurdi died on March 27, after a protracted illness. The late commissioner joined the service in 1988 as ASP cadet officer and rose through the ranks to the rank of a commissioner. There has been shock and fear ,over a strange baby born at a maternity centre (name withheld) situated at Ifosan area of Ilesa, in Osun State. Former Governor of Lagos State, Asiwaju Bola Tinubu, was embarrassed by a thug, Ise Aye, while Tinubu was doing his accreditation at polling unit 047 on Kaffi/Sunday Adigun Street, Alausa, Ikeja. The thug, who had scars on his face and tattoos all over his body, shouted at the governor and accused him of neglecting some of the youths in the area. As Nigerians go to the polls tomorrow in the presidential and national assembly elections, the Independent National Electoral Commission (INEC) says it will announce the result of the elections within 48 hours after voting. INEC Chairman, Prof. Attahiru Jega who revealed this Friday, during a joint press briefing with the Director General of the National Youth Service Corps (NYSC), Brig. Gen. Johnson Olawumi said the electoral body has put everything in place to ensure a hitch free exercise. Former militant, Mujahid Asari-Dokubo has aired his displeasure after his PVC was rejected by the card reader at his polling unit at Bakana in the Degema Local Government Area of Rivers State. The ex militant said no body would leave the polling unit till everyone is accredited as the card reader was also unable to accredit other voters . He said it was a deliberate attempt to disenfranchise his people..
A young boy clearly under the age of 18 had just been photographed by a voter in Taraba state getting his finger prints read by the card reader during the ongoing accreditation process as Nigerians turn out en masse to vote in today’s presidential elections. Behind him are many more underage boys and girls illegible to vote, waiting in line to get accredited and vote! A brother and Joint Arena blog reader reported that people in Festac, Lagos state experienced a peaceful election. What a day to propose....A man proposed to his girlfriend at his polling unit this morning. Congrats to them. 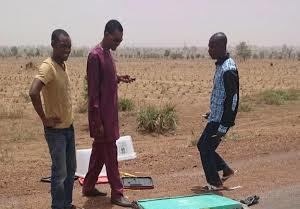 Two people have been killed at two polling units in Birin Bolawa and Birin Fulani in the Nafada district of Gombe state this morning by Boko Haram members. According residents of the villages who spoke with AFP, they said suspected members of Boko Haram stormed the polling units, attacked the electorates and killed two people. An election official who spoke with AFP under anonymity, said: “We could hear the gunmen shouting, ‘Didn’t we warn you about staying away from (the) election?'”. Phil Hazlewood is AFP's bureau chief in Nigeria. According to LI Blog.....A few LIB readers in different parts of the country are sending in reports. One said as at 10.13am this morning, not a single card reader is working in all the voting centers in Jalingo, Taraba state capital. Another said "there's a 100% failure rate at polling unit 032, Ifelodun Local Govt. The card reader is not working. INEC official is trying to get to the IT unit in Alausa to fix the problem. The richest man in Africa and also the worlds richest black man Aliko Dangote was pictured voting at his polling unit today..
May God help Nigeria.....A bomb went off at the Women Training Center in Enugu this morning March 28th. The state police Commissioner confirmed the incident and said anti-bomb squad were immediately invited to the scene and were able to successfully detonate a second explosive found in the premises. Pictured above is the vehicle that carried the explosive device. A former girlfriend of killer pilot Andreas Lubitz claimed the pilot told her once that he's planning an act so heinous his name would be remembered for ever. The girlfriend said Lubitz was a tormented, erratic man who was a master of hiding his darkest thoughts and would wake up from nightmares screaming ‘we’re going down’. You'all earpiece addicts should read this ans learn....According to twitter user 'kosofeinsideout' this man was knocked down by a car at Ojota area of Lagos..He was wearing an ear piece and couldn't hear the sound of the oncoming vehicle..Luckily,he is still alive.. Daredevil robbers have raided a Pentecostal church, Salvation Givers Church International, located at 13, Onaiwu Street, Off 2nd Cemetery road, in Benin, carting away valuable items including cash from the church’s safe. According to Punch, the church members were also beaten up by the robbers when they failed to identify the pastor to surrender the proceeds of the church. The women and ladies in the church were also feared to have raped by the robbers after the bandits ordered their victims to lie down. 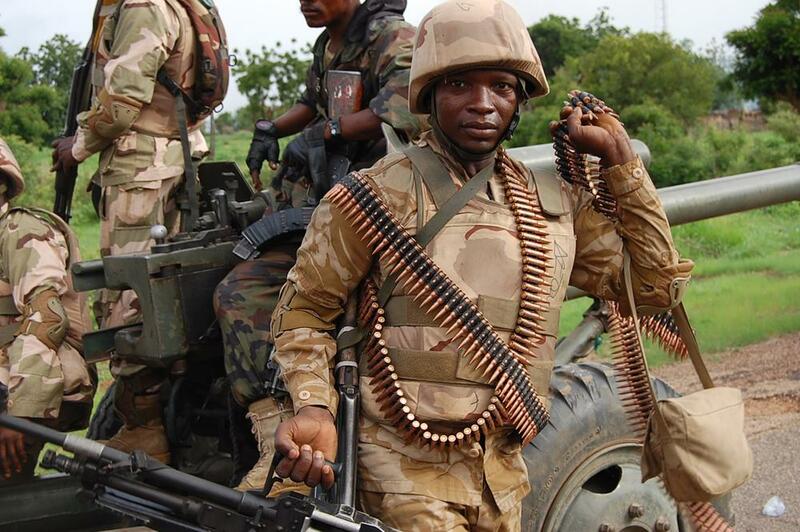 Earlier this week, president Goodluck Jonathan promised that Nigerian troops would liberate Gwoza town from Boko Haram by Friday, March 27th. Thousands of youths led by Alhaji Mujahid Dokubo-Asari, marched the streets of Warri, Delta State, in a show of strong solidarity and support for President Goodluck Ebele Jonathan’s re-election. Under the auspices of the Niger Delta People Salvation Front, NDPSF,Alhaji Dokubo- Asari stated that it shall be gun for gun, bullet for bullet, bomb for bomb should Buhari attempt to cause chaos after losing the election. He said he was corrupt and immoral, while his wife had the guts to insult the women of the Niger Delta, especially the good women of Edo State by calling them prostitutes. The Emereonye family has been thrown into mourning over the gruesome murder of one of its sons, Mr. Emmanuel Emereonye, a federal civil servant. It was gathered that Emmanuel was killed three days to his retirement from the service. Emmanuel, an administrative officer at the Federal Government Girls College, Umuahia, was on Tuesday, March 17, 2015, butchered by a labourer he hired to work for him in his hometown at Dioka Nzerem village, in the Ehime Mbano Local Government Area of Imo State. The stubborn fact of the scientific imagination and reasoning is that it holds true for all seasons and so it is with the prescription of federalism for Nigeria. It was true in 1948, 1960, 1970, 1993 as it is true today. As tomorrow looms large on the horizon of Nigeria’s destiny, I feel called upon to make a restatement of the germane positions that I had taken, especially in the last several months. Going forward to the 2015 general elections I had been guided and instructed by a strategic and tactical purpose in my reflections-that is the long and short term perspective. At all times, it is imperative (with the accomplishment of the objective in view) that we are able to delineate and reconcile both. The strategy is the overall framework within which tactics are accommodated and deployed; and strategies are effective only in so far at it motivates the tactic; and to the extent that they are in a general and continuous state of interaction and responsiveness. There must be inherent harmony and conformity between the two. Angela Simmons and her banging body was spotted at the beach in Maimi Florida...The 27-year-old who has visited Nigeria before is Bow Wow's ex and Run-DMC's daughter..